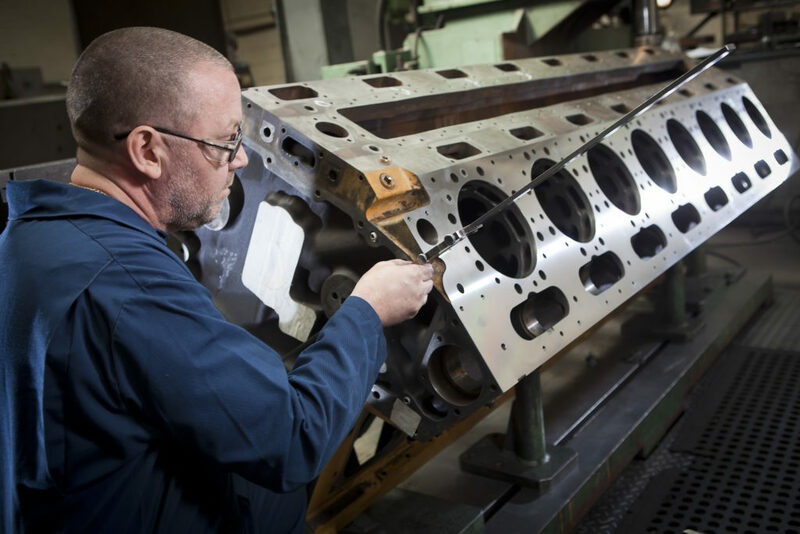 By combining the skills of our workforce with state-of-the-art machinery from leading manufacturers such as Rottler, Hindle Reman can remanufacture all makes of crankcases and cylinder blocks, up to 3.2m in length. We provide cylinder block repair and crankcase repair services for many major OEMs, giving you the assurance that our technical knowledge is second to none. Resurfacing – up to 3.2m long. From small car blocks up to large blocks, such as the Caterpillar 3520. Re-boring oversize blocks to suit pistons available. Re-sleeving, allowing standard pistons to be used. Reclaiming upper and lower liner locations. Line boring of main bearing. Often we are able to bring the cylinder block back to standard size by machining the faces of the main bearing caps and the bore. Line boring of camshaft housings. Reclaiming damaged camshaft bearing locations. Reclaiming spun bearing housings using metal spraying. Repairing cracks by metal stitching. Supplying new parts, as required.